The Alexander Turnbull Library is one of the best research collections in the country. It has all sorts of material relevant to Ngati Porou, from books to historic documents through to whakapapa manuscripts. See below for examples from the amazing staff. It is based in Wellington, and has excellent staff who can help with your research needs. Click here to find out how to start your research journey. Below, staff from the Alexander Turnbull Library share some of the Ngati Porou taonga held in the collection. This beautiful handwriting belongs to Mokena Kohere. This group of letters have been transcribed and translated through a collaborative effort. 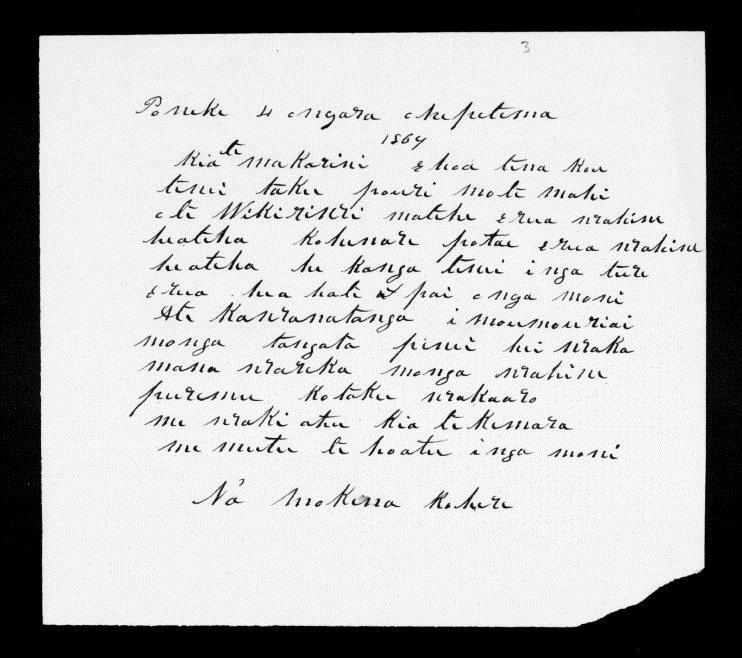 E Ma: Nga Tuhituhinga ki a Makarini, or the E Ma Project was established in 2005 to transcribe and translate the nearly 3,000 Maori letters from the McLean Papers. Here is the transcribed and translated piece for the above letter. Tena koe. Tenei taku pouri mo te mahi o Te Wikiriwhi, mo te he e rua wahine, he ateha, ko Henare Potae e rua wahine, he ateha. He kanga tenei i nga ture, e rua. He aha te pai o nga moni a te Kawanatanga i moumouria ai mo nga tangata penei, hei whakamanawareka mo nga wahine puremu? Ko taku whakaaro me whaki atu ki a Te Kemara, me mutu te hoatu i nga moni. Greetings to you. This is about my disappointment with Te Wikiriwhi, with his having two wives, and he is an assessor, and Henare Potae who has two wives, is also an assessor. This is an insult to the law, these two [wives]. What is the good of the Government’s money being wasted for such men, and for the pleasure of adulterous women? In my view, you should speak to Cameron, and stop their pay. Posthumous awarding of the Victoria Cross to Te Moananui-a-Kiwa Ngarimu's parents, in Ruatoria. Pascoe, John Dobree, 1908-1972 :Photographic albums, prints and negatives. Ref: 1/4-000692-F. Alexander Turnbull Library, Wellington, New Zealand. 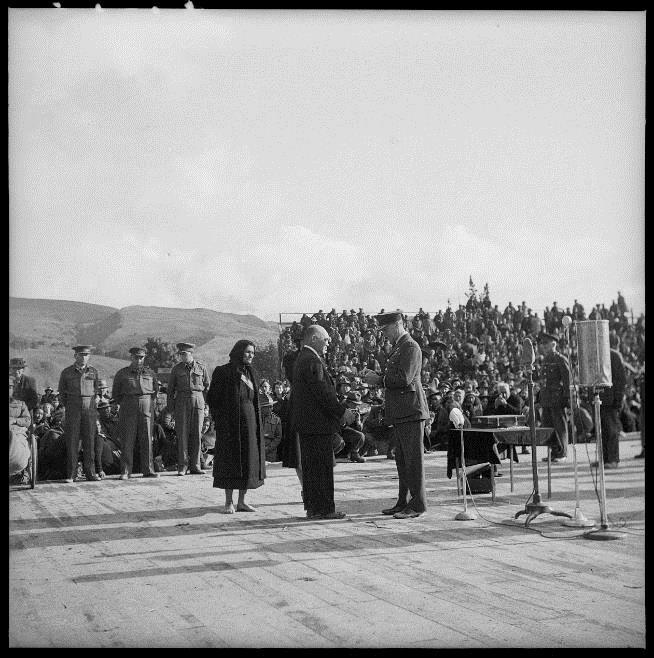 I like this photo, the whole collection in fact from John Dobree Pascoe - this particular photo shows the parents of Te Moananui a Kiwa Ngarimu being awarded his VC posthumously. This photo struck a chord with me as it shows a coming together of whanau, hapu and Iwi to honour a young man who fought for our country with valour and honour. My grandfather served in the Second World War so I have a great interest in the stories of these young men and their families they left behind. I was fortunate enough to visit Ruatoria last year for mahi, and saw where this massive hui took place all those years ago, even now, it was very moving. Scope and Contents : Correspondence, whakapapa, articles, research notes and photographs. Most of the letters are from Te Kani Te Ua to Leo Fowler between 1958 to 1966, plus some undated material. There is also a detailed whakapapa book relating to East Coast whakapapa and histories. 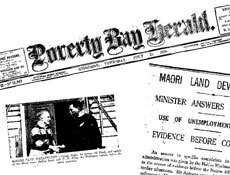 Articles relating to Maori history and culture and Maoritanga. Also correspondence from A H & A W Reed. I have chosen the Leo Fowler papers, which have not been digitised, but there is some significant material in there relating to Ngati Porou. I did some enhancement to the records in this collection which we have had for quite a while now, but just last year I put some more in-depth description on to the collection. I have singled out this folder which has some whakapapa and kōrero which Te Kani Te Ua sent to Leo Fowler. As you can see from the record, this item relates to Ngati Porou and some other iwi from Te Tai Rawhiti. 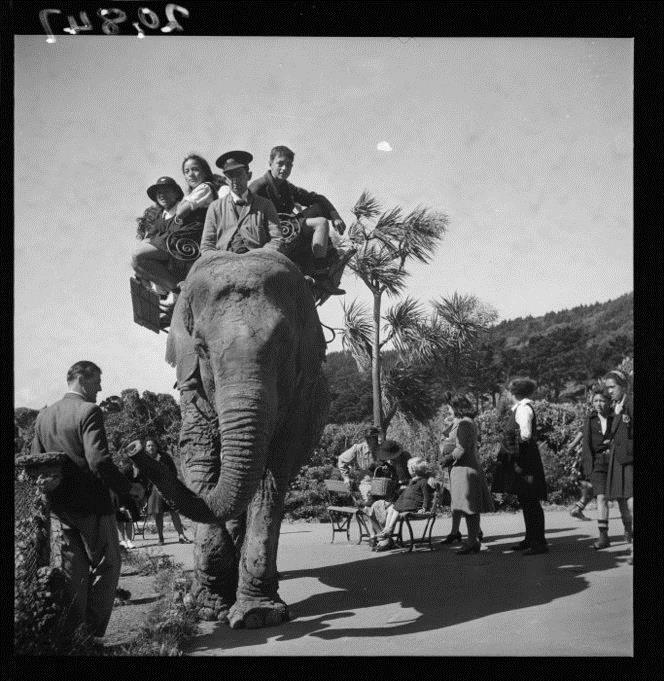 Children from Tokomaru Bay, East Coast, riding on an elephant at Wellington Zoo. Pascoe, John Dobree, 1908-1972 :Photographic albums, prints and negatives. Ref: 1/4-000847-F. Alexander Turnbull Library, Wellington, New Zealand. 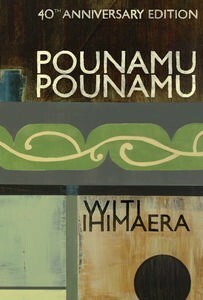 My favourite is Pounamu, Pounamu by Witi Ihimaera. Published in the early seventies, I still remember having these stories read to me at primary school, especially 'A game of cards.' Ihimaera's writing was a breakthrough in contemporary New Zealand fiction, providing a Maori world view through a distinctly Ngati Porou lens. It was possibly also the first book of its type to be translated into Te Reo and published commercially.